If I remember correctly the Spooks Scooter Club started about 1957-58 as a breakaway group from the Lambretta Club 150. They used to meet at a café above the Century cinema in Pitsea. The main reason being we wanted to cater for all makes and a bit more of a social menu that is to meet more often. 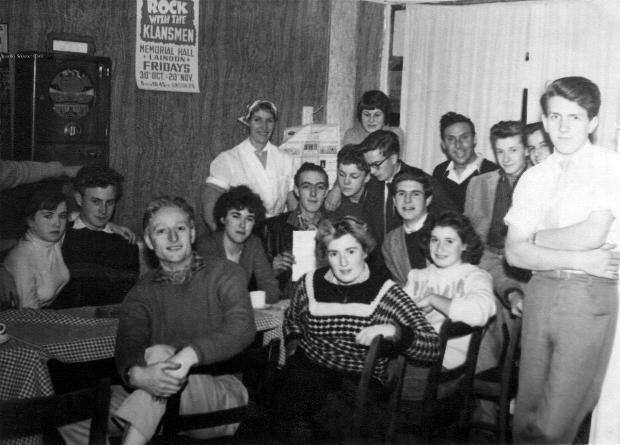 An early meeting held at a café in Vange around 1957/58. Dave King. He was a police cadet then, must be a Chief Constable somewhere by now. He rode a Lambretta LD 125. Pete (Gonker) and Dave Smith. They both had Lambretta D Type Sports. Tony Buckley: Lambretta D Type Sport and later a Triumph Tigress. Pete Cobb: Lambretta Li 150. Alan Taylor, Lambretta LD 150 (I think). Peter Hayden: Puch Alpine thingy. Carole Pither: Lambretta LD 125. Terry and David Gilbey: Lambretta Li 150. Brian Duprey: Lambretta Li 150. Roger Plummer. I had a Vespa GS for a short time but soon settled for a wheel on each corner preferably all driving. Other non owners were: Jim Stelling, Pat Holder, Pat Fletcher, Pete Hammerslag, Kay Wallace, Sylvia Keogh, Maureen (Divi)???. Our first meeting place was the café in Vange between the fire station and the working mans club. We then moved to a café on the A127 next to the Cricketers Pub. The final move I remember was to Chestnuts Caravan Park, Crays Hill, near Wickford. Once we went horse riding at Basildon where the hospital now stands. We all went riding or played at it, and then Kay Wallace joined us. Another time we saw a new face at the florist shop in Vange so sent Ken Cook a bouquet of flowers, he was doing his duty for Queen and Country in Aden at the time and Carole Pither joined us. Maureen (Divi)?? ?, worked at Vange Co-op hence her nickname. Membership drives a piece of cake. Some of our more memorable outings were Burnham-on-Crouch carnival, always a good time. We did that 3 or 4 years on the run. I also remember "Rodders Round Up" in Danbury a couple of times, also a barbeque on the beach at Shoeburyness, and a Jazz and barbeque at Great Wakering. There was also a Club 150 barbie in the outback near Billericay, oh and some parties down the Barn at Vange. 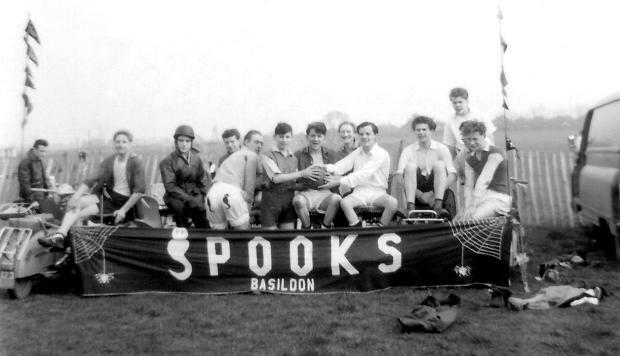 Spooks versus Grays Scooter Club at Blackshots Sports Ground, Grays circa 1959. We lost 13-0! If I have forgotten anyone I apologise it is just that it was all such along time ago. That's about all I can think of for now. I just know as soon as I wrap this up it will all come flooding back but hay ho. I'm sure there are other members out there who can add their memories to this site. Regards to all, Roger. Title: Spooks Scooter Club by Roger Plummer. Copyright: © Roger Plummer, October 2009. Comments: This account was supplied by Roger Plummer for use on the Basildon History website.